The BRIESE striplight system offers a high level of creativity. The reflectors allow adjustment for either vertical or horizontal format. Brilliant applications can be realized with BRIESE striplights. The evenly lit diffuser surface can be easily imaged onto polished surfaces without any limitation. 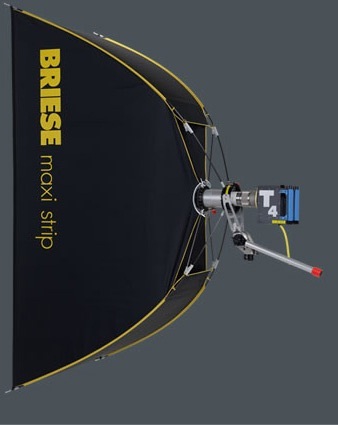 BRIESE striplights are ideal for tabletop photography. The narrow reflector form allows it to be placed close to the camera axis. The 85×200 (approx. 32” x 78”) Maxi Strip generates a narrow band of light with which you can make excellent side or skylights. Very popular for car photography. The Briese Maxi Strip is compatible with the H2 and H5 (2K and 5K Tungsten) lamp heads, as well as the 1.2K, 2.5K, and 4K (HMI) T4 lamp heads.